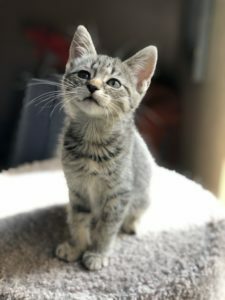 Patty – Female DSH 12 Weeks a 4/12/19 fa – Foreclosed Upon Pets, Inc.
Patty is a sweet tabby girl. She loves to play with her siblings. She has a hearty appetite and loves temptations kitty treats. She had a blurry left eye but it is almost completely healed. She doesn’t let anything hold her back as she has a good amount of energy. Her adopt fee is $125.00.